Dental assistant isn’t a job that, at first glance, isn’t that easy to understand. The job title is pretty open-ended and most people are more familiar with the responsibilities of their dentist, rather than their dentist’s assistant. This has led to some misconceptions about exactly what a dental assistant does. Well, we at Northwest want to debunk some of those myths and emphasize that dental assistants are a vital part of any dental team. While it is true that it is possible to become a dental assistant without first attending a formal dental assisting education program, this does not make it by any means easy. Most dental practices prioritize applications with formal training and, even if you do get the position, you’d find yourself in a fast-paced environment, filled with professional vocabulary that is both extensive and can sound like a foreign language at times. Dental assistants who chose to pursue a dental assisting certificate or a qualification from a formal dental assisting program, like the one here at North begin by studying in the classroom, just like any other formal training. Through rigorous study, dental assisting students accumulate experience through clinical lessons and dental practice externships. 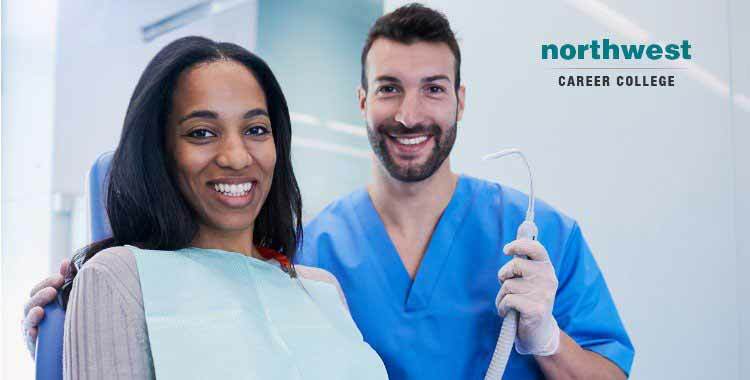 Dental assisting programs typically require a year-long commitment from start to finish, but here at Northwest, you can graduate in as little as nine months. Dental assistants need to know just as much about dental instruments and procedures as the dentists themselves. A good assistant also knows the ins and outs of the office, and understand about federal and state laws, standards and guidelines related to dental care. Dental assistants are also required to constantly continue their education. Dentistry, like most medical fields, is an ever-changing, with regular introductions of new technology, methods, and procedures. In any modern dental practice, dental assistants are required perform a variety of tasks and duties. These can include maintaining the dental office schedule, setting up dental exam rooms, implementing dental infection control protocols, communicating with and educating patients, and ensuring they understand and are comfortable with the procedure they are about to undergo. In order to do their job well, a dental assistant must stay one step ahead of the dentist at all times and keep everything running as smoothly as possible throughout the entire day. A dental assistant’s daily responsibilities is no small task list. The simple fact is that dental assistants are just as important as any other member of the dental team. Many dentists would be happy to tell you that they could not do their job without the support of a good dental assistant. A dental assistant is as vital to a dentist as a theater nurse is to a surgeon. Only by working together, and with the assistant’s support, can the dental team be truly successful. Dental assistants are so vital to most dental practices that each year, the first full week in March is dedicated to appreciating the responsibilities of dental assistants during Dental Assistants Recognition Week. There are a range of factors that can affect a dental assistant’s pay, such as which state they work in and their experience level. Dental assistants who are just starting out in the field often earn a base entry-level salary, which rises as they become more experienced in the field. On average, a dental assistant earns $36,940 a year with more than half of working dental assistants earning far more according to the United States Department of Labor, Bureau of Labor Statistics (BLS). Employment for Dental Assistants is also expected to increase 18% between 2014-2024, faster than average for all occupations according to the BLS, making now an excellent time to qualify as a dental assistant and become a vital part of a dental practice’s team!